Presenting manicured grounds and beautiful Indian architecture, the luxurious Rambagh Palace was the former residence of the Maharaja of Jaipur. Now a luxurious hotel, it features an indoor and outdoor pool, as well as full spa services. Spacious air conditioned rooms are decorated with rich textures, elegant carpets and hand-painted wall motifs. A flat-screen TV, personal safe and minibar are included in all rooms. Modern bathrooms have a walk-in shower and separate bathtub. 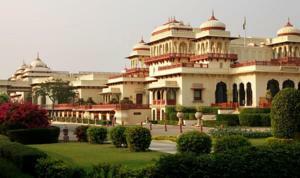 Known as the "Jewel of Jaipur", Rambagh Palace is about 2 miles from the City Palace, Hawa Mahal and Jantar Mantar. It is 7 miles from Jaipur Airport. Free on-site parking is available. Relaxing massage can be enjoyed at Jiva Grande Spa. Guests can also practice yoga with experienced gurus or exercise at the gym. The palace butlers can help guests arrange vintage horse-drawn carriage rides every evening. Breakfast and light meals are served at The Rajput Room while Verandah features traditional afternoon tea, champagne and pre-dinner cocktails. Other dining options include Indian cuisine at Suvarna Mahal, outdoor casual dining at Steam and drinks at Polo Bar. Rooms: Hotel Rooms: 79, Hotel Chain: Taj Hotels & Resorts. Free! Up to two children under 12 years stay free of charge when using existing beds. One older child or adult is charged INR 2303 per night and person in an extra bed. Maximum capacity of extra beds in a room is 1. There is baby beds in a room is 0 capacity for cots in the room. Any type of extra bed or crib is upon request and needs to be confirmed by the hotel. Supplements will not be calculated automatically in the total costs and have to be paid separately in the hotel.